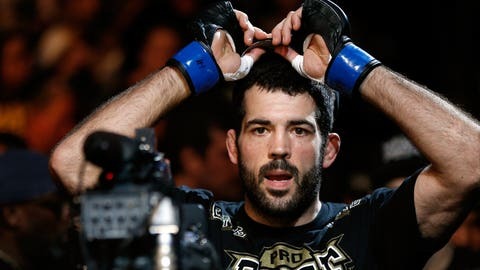 Matt Brown still has Carlos Condit on the mind even after pulling out of their fight. Matt Brown instinctively knew something was wrong. The UFC veteran had wrenched his back going for a takedown in practice, and the pain that shot through his body stopped him in his tracks. But this is the hurt business, after all, so with a huge opportunity against No. 2 welterweight Carlos Condit just over a week away, Brown kept thinking positive thoughts. It’s just passing pain, he thought. It will go away. Except it didn’t. It was so bad that if he sat for too long in one place, he couldn’t even walk. Still, his mind was determined to do what his body could not. "Originally, I was going to go through with it," Brown told FOX Sports on Tuesday. "I was dead-set on it. At that moment, I was like, "I’m going to do it. I don’t care how much I hurt." But when cooler heads prevailed and medical attention was sought, an MRI revealed one torn disc and another that was bulging. Brown, being who he is, had to at least explore the possibility of competing, so he took a cortisone epidural injection. With it, there was a chance to mask enough pain that he would feel at or near 100 percent. It was worth a try, but after receiving the shot, he only felt marginally better. Thirty to 50 percent at most. That was when he learned of the potential of worsening the injury by rupturing a disc. After all, pain is the body’s way of telling you that you shouldn’t be doing something, so hiding that pain could allow you to bypass more serious concerns. In Brown’s case, it could have led to a far more severe injury that could be a career-ender and affect him for life. I feel like I let everybody down. I know I didn’t; I did the best I could, but that’s what it feels like, regardless. Luckily, he had people who care about him in his corner, namely his wife and trainers, who told him that enough is enough, and that it wasn’t worth the risk. Finally, he acquiesced. For the first time in his career, he was forced to withdraw from a fight. During camp, he was so focused on preparing for Condit that he had no idea how anxiously awaited the matchup had become. After all, it was not the headliner or for a championship, but to pure fight fans, this one was a gem, a matchup of two fearless combatants with endless reserves of firepower and will. It was only after pulling out and receiving waves of support from fans that made him realize the anticipation level that had been building around him. In a way, that was like another painful blow. That’s why he looks forward with thoughts of giving them what they wanted. This is f—ing stupid. I’ve never pulled out of a fight in my life. Brown is still in pain but says his doctors have told him that if his physical therapy goes well, he could be back in full training in about two months. That could put a potential cage return around the spring of 2014. Brown aims to oblige him, and ensure that one of 2013’s most anticipated fights will find a completion date, even if it’s in the next calendar year. "Absolutely, I still want the fight. I’ve been eating, sleeping and breathing Carlos Condit for 10-12 weeks," he said. "When they talked me out of it, I was still in the mind set of, ‘I’m going to fight, no matter what.’ I think from that moment up until the fight, it would have dawned on me at some point, ‘This is f—ing stupid.’ I’ve never pulled out of a fight in my life. We’re running a marathon, not a sprint. So even if I’d gone in there and won this fight, if I can’t fight again, what good is it? I have to get healthy, and yeah, after preparing for him all this time, he’ll be on my mind."